It's finally here! 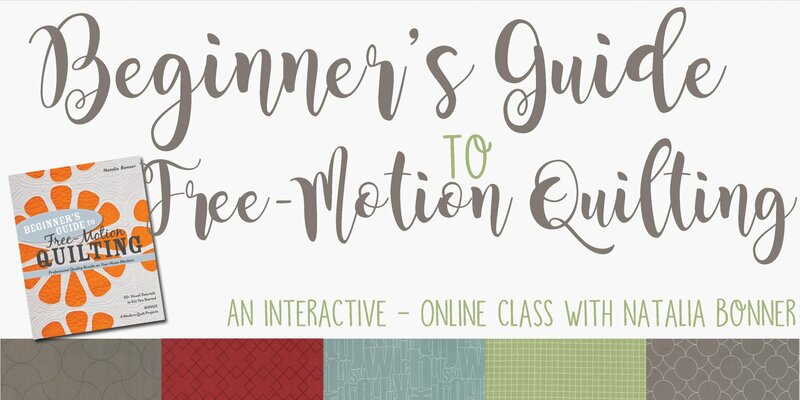 Natalia has been traveling the United States and Canada teaching her widely popular class, Beginner's Guide to Free-Motion Quilting. Now is your chance to take this class online, and more in depth then ever. Summer 2019 Class Begins June 3rd! Picture this - more than 50 quilting designs to create modern quilts with classic style! Natalia's instructions are detailed videos that make it much easier to get beautiful results on your quilting or sewing machine. Tips for choosing batting and thread, layering and basting, starting and stopping, and prepping your machine are included. • Loops and swirls, feathers and flames, flowers and vines, pebbles and more! This hands-on class will last six weeks. *Classes will be available forever after purchasing and Natalia will answer questions and be interactive on the group page for one month following the completion of the class. *On Moday of each week a new video will be posted, in each video Natalia will post a detailed video explaining in depth and showing you step-by-step how to quilt each of the motif's. *On Friday of each week Natalia will be LIVE on video chat for up to one hour, at to answer any questions you have had during the week practicing the motif's you've learned at the first of the week. *Supply lists will be sent to registered students once registration is complete.